Our bungalows are ground level, situated among the lush gardens of our property, with only 8 bungalows to a quadrangle, or in the adjacent section, the rooms are four to a section. They are just steps away from the beach, and although they do not have a view of the ocean, they make up for it in charm, privacy, and convenience. You just walk a few minutes and you are in the center of the property where the food service areas are. Many people prefer staying in the bungalows instead of the ocean front rooms! Stay in a comfortable bungalow inside the spa area and receive special rates for spa treatments for the perfect wellness getaway. Relax in the comfort of a room with kitchen facilities and plenty of room to eat meals as well as relax in the love seat. Includes coffee maker, full-size refrigerator, cook tops, microwave and toaster oven. 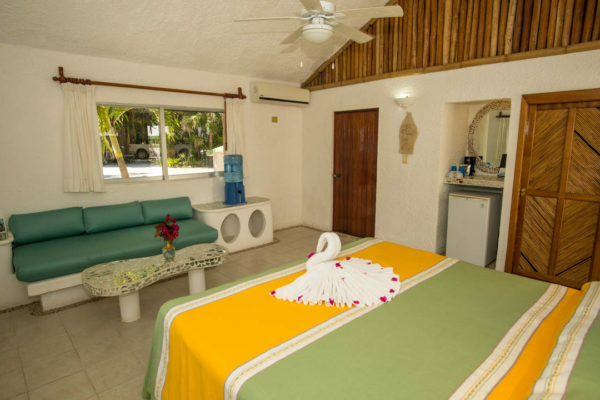 Villas Flamingo are 4 luxury individual villas overlooking the sandy beach section of Half Moon Bay. Spacious two-bedroom accommodations with outdoor living space right on the ocean. Condo 1 is a three-bedroom, three-bathroom unit located on Half Moon Bay.